UPDATE : Visit the new page of the project to check the new features. The last weekend I was working in a new project called Delphi IDE Theme Editor. this tool allow to change the Delphi (Rad studio) color settings. the application was written using Delphi XE and the Unicode SynEdit components. 35 themes are included, ready to use in your Delphi IDE. See how the tool can import a Visual Studio Theme (.vssettings) and apply this style to Delphi IDE. 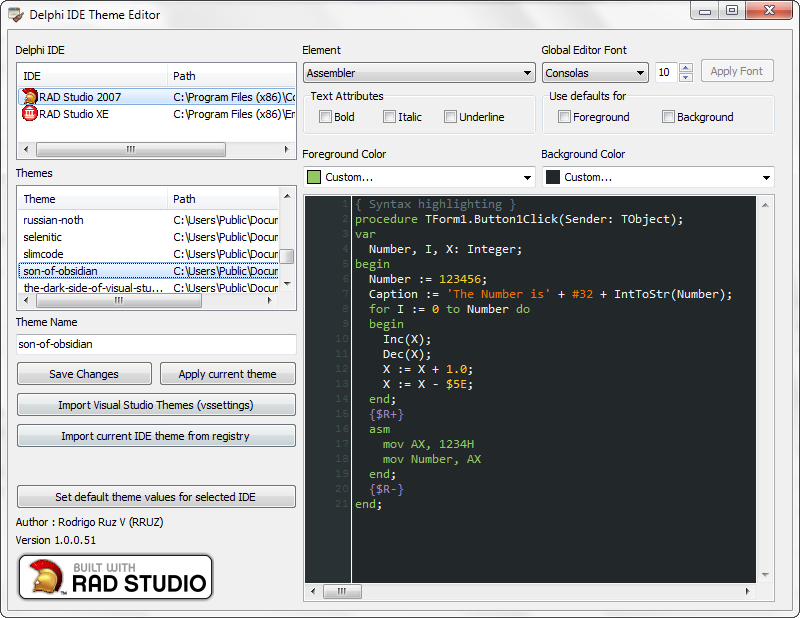 Check the site studiostyles to get a lot of themes which you can import to the Delphi IDE. In the next days I will publish the full the source code and the technical details of the tool, so stay tuned. Let me know If you have any suggestion or comments to improve the application. I think it would be nice to have as a feature to click anywhere on the preview syntax highlighter and modify that particular attribute. And since you’re using SynEdit, I think it should have a GetHighlighterAttriAtRowCol function which gives you details as to what the attribute at specified XY is. Otherwise a really nice tool. Something which Delphi has lacked. Aldo, thanks for your suggestion. Wow, great work! I think you are the guy who answered my quenstion about that on stackoverflow, right? As soon as you publish the source code and if you allow me, i’d like to create a delphi addon based on your code. Are you going to published that on the GPL license? Yes I answer your question in S.O , about the code, i need to make some modifications and improvements when this is done, i will publish the source code, in the google code site. about the license, i don’t know yet which license i will use. I am Looking forward to it. And again, very nice job! Just curious… What theme you personally use? Before to write this tool i use a variation of this theme , now i use the imported version of the ocean vs theme located here. briantokyo, yes i like the themes of the notepad++, maybe in a future version will support this. Fantástico trabajo como siempre. estaría bien que la gente pudiera compartir sus temas y así crear una biblioteca. Neftai gracias por tus comentarios, sobre el tema de la biblioteca de temas seria genial. Muy buena herramienta para personalizacion del IDE. Hay alguna manera de modificar el lado izquierdo (ahi donde estan los numeros de linea)?, he probado de todo y es lo unico que no pude cambiar. Pitfield, debes elegir el elemento line number para modificar el panel de numeracion de lineas. no encuentro esa opcion en el combobox de elementos… tengo la version 1.0.0.51, es esa la ultima version? Pitfiend, que version de delphi estas usando? Pitfiend, la numeracion de lineas esta disponible desde delphi 2005. Looks really great. Downloading now. The ability to load themes like you can in VS is something I really missed in Delphi. Thanks for adding it. Kevin, Thanks for your comments. Ok found the reg file the tool makes and made the registry path changed. But it would be nice to be able to specify that inside the application. It is just a string that you then use instead of BDS for Delphi 2006 for instance. A lot of tools I have seen (including GExperts) forget about custom profiles. Iztok, i will consider your suggestion for the next version of the tool. I have been using it for a little bit now and you’ve done a great job. Two comments/suggestions. 1) I wish there was a “Save As…” option so that I could easily save changes from one theme as a new theme. This would allow me to use an existing theme as a baseline for others. 2) It would be nice if the Themes Listview was anchored so that it could grow vertically as the main form’s height was increased. There are a lot of themes for such a small viewable area of the list. Thanks again for a nice add-on that should have been part of Delphi for years. Very nice job. That was really missing. Would be great maybe to add the ability to import themes from a few more guis other then that nicely done congrats! Hi, this is a great tool which has been sorely lacking in Delphi. Thank you for making this available for us. Am I doing something wrong or can I fix this manually in the xml file? I can send you the xml file if you want? I’m using Delphi 2009. Brilliant … I’ve been using [not recently] ColorIDE which was written for a much older version of Delphi by Andrew Rybenkov. Thanks for your comments, I see this application many years ago too. It will be really useful if your program will be able to set a color to ‘Default’ as Delphi IDE does. Error loading values of current theme-message: Cadena calse no valida, ProgID:”Msxml2.DOMDocument.6.0″: Trace (000965CB)[004975CB] y mas de estos numeros…. Me pueden ayudar, me parece muy buen aporte el Delphi IDE Theme Editor, pero no me funciona….. Brilliant application. You’ve just made my day :) Thank you. Download link dead, please fix. Awesome. Just import my colors from VS2008 and it’s easy to switch now. File not found on Dropbox……..